Lith Printing is a special creative black and white printing process whereby the resulting prints have delightful deep blacks, delicate highlight separation, but are also grainy and can posess an almost impressionistic look. Not all black and white paper is suitable for lith printing and some papers are well known for their lith printing capabilities. 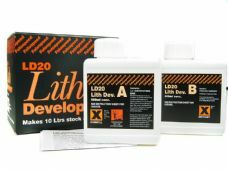 A special developer is required for Lith printing.